You know that whatever happens in Vegas is supposed to stay there, right? Today’s Vegas-located Nice Price or Crack Pipe FJ might just let you take your experiences outside the city limits. That is, if its price and condition aren’t too much of a gamble. Someone else’s work is always a gamble, especially when you’ve been provided with far too little information so as to judge the quality of that work. Such was the case with yesterday’s 2003 BMW 540i Wagon, a car that came with an added manual gearbox and supercharger on the engine, but also with an utter lack of description as to how that work was done. Where are the receipts? Or, at the very least the comprehensive build thread that inevitably accompanies such fanatically followed niche-mobiles? Alas, it was not meant to be. Also not meant to be was a win at the car’s long-standing eighteen-grand asking price as it fell in a can’t-argue-with-that 83% Crack Pipe loss. At what point does a car’s patina take over? Is there a fine line between a well-aged, lived-in look and something that the neighbors will complain to the HOA about you parking in the driveway? This 1973 Toyota Land Cruiser seems well on its way from that favorite jeans scruffy look to full-on hobo encampment under the freeway overpass grungy. It’s not that it’s dirty, it’s just looks worn, as though it’s been driven in the desert every day for the past few decades. And you know what? Apparently it has. It’s described in its ad has having been owned by the same family for 25 years and to have been dutifully maintained by them during that time. Now they’re apparently done with it and are ready to move on even if the FJ itself isn’t quite ready to let go. Being an inanimate object, it probably doesn’t really care whose butts are in its seats, but it’s still sad to consider it a cast off after quite so long. The ad says that it still starts and runs like a sewing machine, and that the frame is sound and rust-free. Maybe they’re just not “into it” any more. Sadly, that same rust-free claim can’t be said of the bodywork, although the surface rust and somewhat rumpled look simply just adds to the car’s charm. There’s a hardtop and doors, plus a soft top for when you want to go soft on the top. Also included is a garage winch for storing the hard roof when it’s not on the car. It’s like the three-season porch of auto-dom. The ad says there’s 75,000 miles on the clock, however the picture of the gauge cluster shows 54,456 on the car’s five-barrel odometer. It also shows that the legend for the speedometer reads “SPEED mph” in the same font as the odo, and that’s pretty neat. That’s about the only thing that is neat, or tidy, about the car. There’s rubber diamond plate on the front floorboards, and I’d not like to think what’s under there—probably a floor but you never know. The addition of a radio is comical both in practical application as these things are so noisy a radio would be hard pressed to make an aural dent, and in the fact that it’s an eighties Ford unit which wouldn’t necessarily be your fist choice, but was probably something that was just laying around. Mechanically, there seems to be nothing amiss, the 3.9-litre six seemingly being complete. That’s backed up by a three-speed stick and part-time 4WD. Drum brakes do stopping duties at each corner. 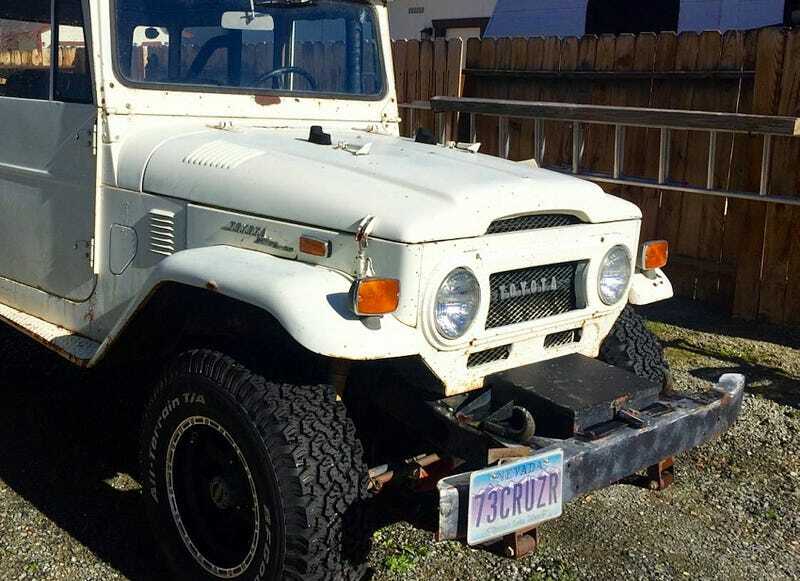 The asking price for this original and well-worn FJ is $12,000. If you’re thinking that’s a lot for an old Land Cruiser, have a look at this one at more than three times the asking, and found by VentoGT, and then decide. Okay, time’s up! You now have the opportunity to vote on this patina’d FJ and that $12,000 asking. What do you think, does that seem like a deal to slip into something so comfortably worn-in? Or, for that kind of money, would you prefer something that less likely to give you lockjaw when you drive it? Las Vegas Craigslist, or go here if the ad disappears. H/T to Vic-ch for the hookup!